BEIJING, May 1 (Xinhua) -- China and the Dominican Republic signed a joint communique in Beijing Tuesday on the establishment of diplomatic relations. 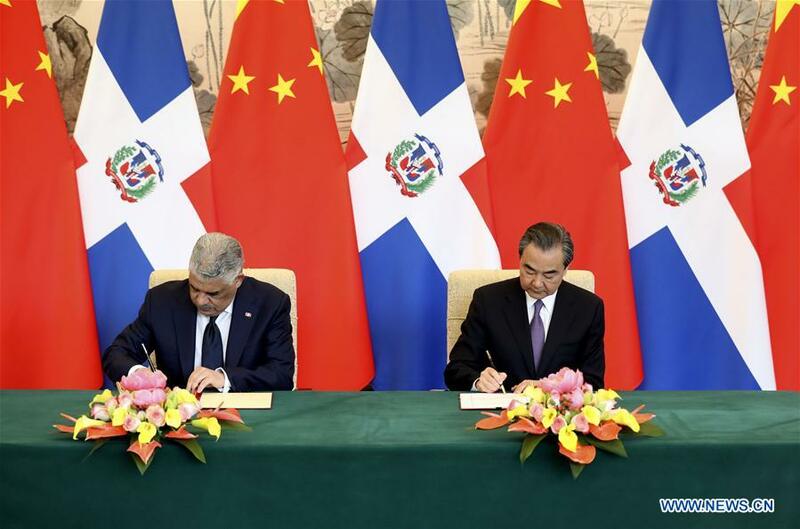 The communique was signed by Chinese State Councilor and Foreign Minister Wang Yi and Dominican Foreign Minister Miguel Vargas. "The Government of the Dominican Republic recognizes that there is but one China in the world, that the Government of the People's Republic of China is the sole legal government representing the whole of China, and that Taiwan is an inalienable part of China's territory," according to the communique. "Hence the Government of the Dominican Republic severs 'diplomatic relations' with Taiwan as of this day," the communique said. According to the communique, the People's Republic of China and the Dominican Republic, in keeping with the interests and desire of the two peoples, have decided to recognize each other and establish diplomatic relations at the ambassadorial level effective from the date of signature of the communique. "The two governments agree to develop friendly relations between the two countries on the basis of the principles of mutual respect for sovereignty and territorial integrity, mutual non-aggression, non-interference in each other's internal affairs, equality, mutual benefit and peaceful coexistence," the communique said. Adhering to the one-China principle is a universally recognized international norm and the consensus of the international community, as well as the fundamental prerequisite and political foundation for China to establish and develop relations with any country, Wang said. The Dominican Republic has resolutely decided to recognize and make a commitment to abiding by the one-China principle, and to establish diplomatic ties with China without any preconditions, according to Wang. "This important and correct decision made by the Dominican Republic is fully in line with the fundamental interests of the country and its people,with the trend of the history and times, as well as with the international law and the basic norms of international relations. We highly appreciate that," Wang said. Vargas said that it is a correct and important step forward for the Dominican Republic to forge diplomatic ties with the People's Republic of China, and the Dominican Republic is now standing with the other 175 countries that support the UN General Assembly Resolution 2758. The Dominican Republic has cut its so-called "diplomatic ties" with Taiwan, and it will no longer have any official relations or any official exchanges with Taiwan in any form, he pledged. The establishment of diplomatic relations between the two countries opens a new chapter of bilateral ties, Wang said, noting that both sides will promote South-South cooperation and maintain the common interests of developing countries. Establishing diplomatic ties with China brings the Dominican Republic great opportunities and will benefit the people of the Dominican Republic, Wang said. As an important economic entity in the Caribbean region, the establishment of diplomatic relations between China and the Dominican Republic will inject new impetus into China-Latin America cooperation, Wang said. The Dominican Republic appreciates China's important role in international and regional affairs, Vargas said, noting that his country will have close multilateral coordination with China. Vargas said the Dominican Republic is willing to work with China to enhance political trust, strengthen exchanges at various levels and carry out cooperation in trade, investment, tourism and education.